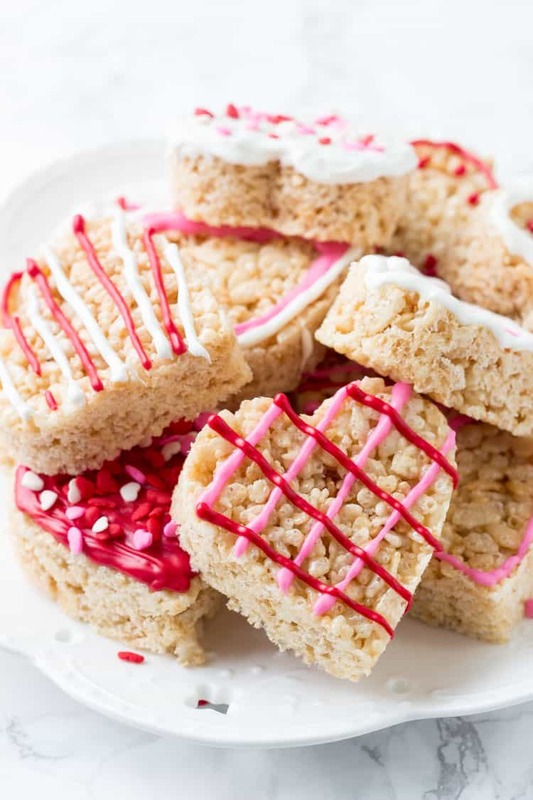 These Valentine’s Rice Krispie Treats are an easy, fun & festive recipe for February 14th. Kids will love making them, and they’re a perfect treat to bring to school or Valentine’s day parties. Hi! It’s Fiona stopping in from Just So Tasty and today I’m sharing these Rice Krispie Treats that are perfect for Valentine’s Day. I usually find January to be a little dreary and dull – so I always get excited when February 14th rolls around and there’s something to celebrate. Valentine’s Day is such a fun holiday, and it’s the perfect excuse to make something tasty. In a large saucepan melt together the butter and marshmallows while gently stirring. Once completely melted, stir in the rice krispies. Then press the mixture down into a greased 9×13 inch pan. 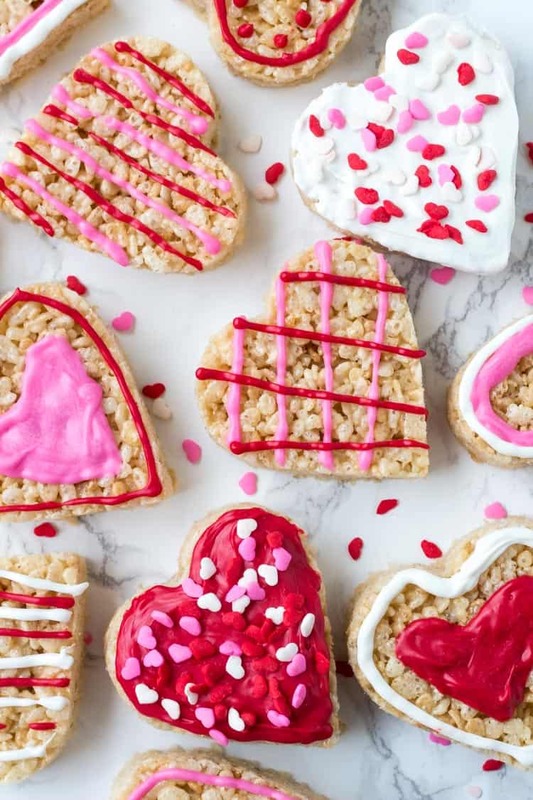 Once the Rice Krispies have fully hardened, it’s time to get out your cookie cutters and cut out Valentine’s day shapes. Then for decorations – I used white, pink and red candy melts along with some heart shaped sprinkles. You can either using a piping bag with a round tip to decorate (I find the #4 tip works well) – or pour the melted chocolate into a small ziploc bag and cut off a tiny opening on one of the bottom corners. 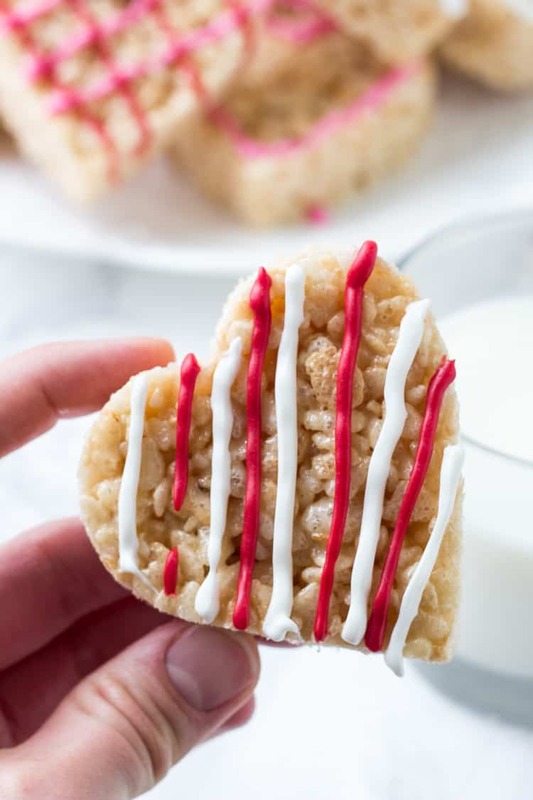 These Valentine’s Rice Krispie treats are so easy to make, and are so adorable. 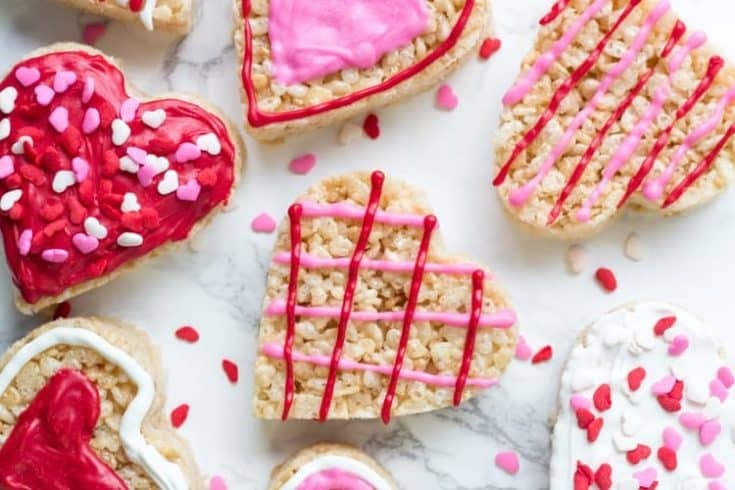 So if you’re looking for a fun dessert for Valentine’s Day, or just love Rice Krispies – then these are for you! 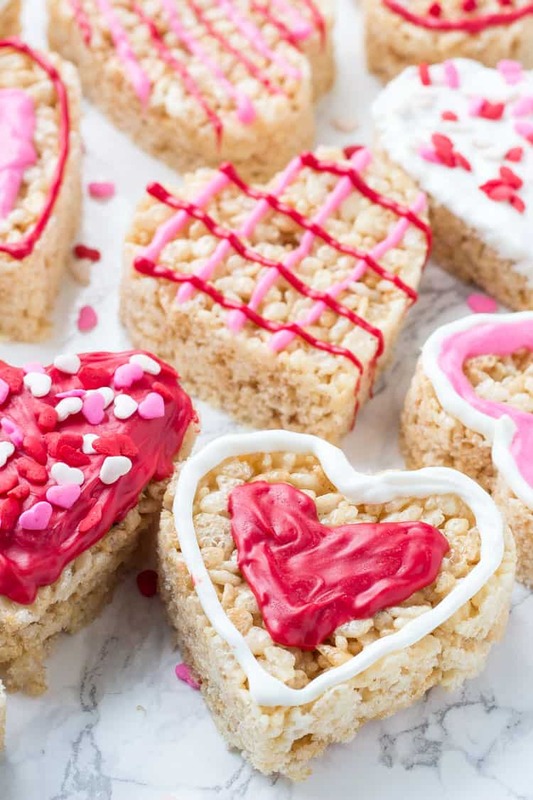 These Valentine's rice krispie treats are an easy, fun & festive recipe for February 14th. Kids will love making them, and they're a perfect treat to bring to school or Valentine's day parties. Spray a 9x13 inch pan with non-stick cooking spray or grease with butter. In a large sauce pan over low heat melt together the butter and marshmallows while stirring gently. Once fully melted remove from the heat and stir in the Rice Krispies. Press the Rice Krispie mixture tightly into the bottom of the pan, either using the bottom of a spatula or a piece of wax paper. Place in the fridge to harden, or harden at room temperature. Once firm, cut into shapes using lightly greased cookie cutters. Melt the candy melts according to instructions on package. Decorate the Rice Krispie Treats using a piping bag or ziploc bag with the bottom corner cut off and decorate with sprinkles. Hi! I'm Fiona and I love to bake! I share easy, from scratch recipe for cakes, cupcakes, cookies & desserts.